It’s cold – as if I needed another excuse to stay in and read! This winter in Houston is being especially wintery (excuse my technical jargon).� It is so cold. My nose is cold. My toeses are cold. I’m so cold.� If my family would let me I would just sit right here in my comfy house until summer.� Remember summer?� Ahh, heat, I miss you.� And, for good measure, humidity, I miss you too. My hair looks great but, dang, I don’t want to go anywhere!� Good news, here are six great excuses to curl up and stay home. We made it just in time for a New Year and a new resolution (read more books?). Here is the Greater Houston Moms Winter Reading List. It’s a book club – come read with us! This is a must-read for anyone planning a trip to Big Bend! In 1916, Hallie Crawford went to teach school in Presidio, just across the Rio Grande from Ojinaga, Mexico, which had been recently captured by Pancho Villa. Hallie’s father, considering this a dangerous place for a young woman of nineteen to live alone, told her he thought she was going on a wild goose chase. “Then I’ll gather my geese,” she told him, with determination and independence. These traits stayed with Hallie all her life, and were indispensable in her role as a ranch wife. Raised as a “proper” Southern woman, Hallie was not prepared for the difficulties she faced when she moved to her new home, the Stillwell Ranch, in 1918. But she quickly became an invaluable part of the workings on the ranch. She watched and learned from her husband, Roy Stillwell, and she adjusted to the new life-style that she grew to love. The ranch hands, who thought she would only last six months, came to respect her and her abilities to do as much work as any man on the ranch. They became a family. Then Roy and Hallie started a family of their own. Three children were a handful, and the Stillwell family split its time between the ranch and a home in town. On the ranch outside Marathon, near the Mexican border, work was hard and joy came in the simple things. After working cattle all day, relaxing under the arbor in front of the house was a pleasure. Hallie had a favorite rock out behind the house, and she often sat on it to watch the sun set, take a break from her energetic youngsters, or otherwise gain some tranquility and perspective.The ranch and its inhabitants survived two world wars, the depression, droughts, an influenza epidemic, as well as the everyday troubles of ranching in the Big Bend country. Hallie’s story, told in a personal and engaging way, is fascinating reading for anyone interested in the history of pioneering ranching in Texas. When Myriam, a French-Moroccan lawyer, decides to return to work after having children, she and her husband look for the perfect nanny for their two young children. They never dreamed they would find Louise: a quiet, polite, devoted woman who sings to the children, cleans the family�s chic apartment in Paris�s upscale tenth arrondissement, stays late without complaint, and hosts enviable kiddie parties. But as the couple and the nanny become more dependent on one another, jealousy, resentment, and suspicions mount, shattering the idyllic tableau. Building tension with every page,�The Perfect Nanny�is a compulsive, riveting, bravely observed exploration of power, class, race, domesticity, and motherhood�and the American debut of an immensely talented writer. �The murderer is with us�on the train now . . .� Just after midnight, the famous Orient Express is stopped in its tracks by a snowdrift. By morning, the millionaire Samuel Edward Ratchett lies dead in his compartment, stabbed a dozen times, his door locked from the inside. Without a shred of doubt, one of his fellow passengers is the murderer. Isolated by the storm, detective Hercule Poirot must find the killer among a dozen of the dead man’s enemies, before the murderer decides to strike again. 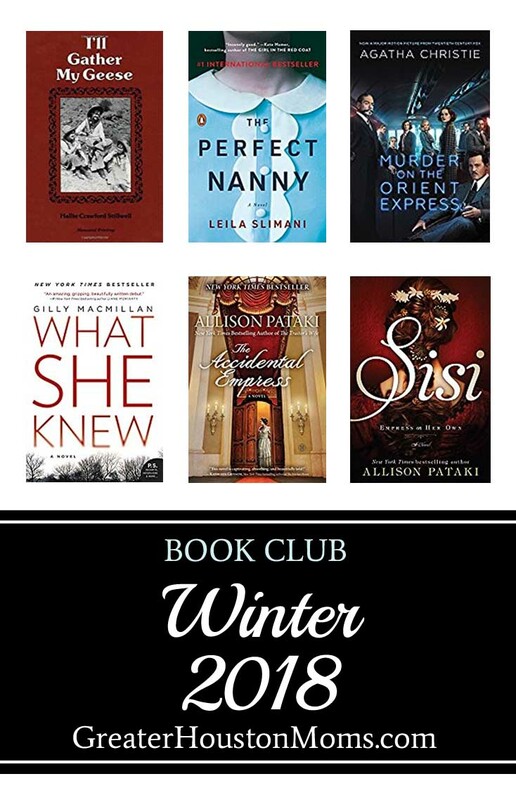 While not an “official” series by Allison Pataki, the first book�The Accidental Empress,�published in 2015, and�Sisi: Empress on Her Own, published in 2016, are�a continuation of the same story. Married to Emperor Franz Joseph, Elisabeth�fondly known as Sisi�captures the hearts of her people as their �fairy queen,� but beneath that dazzling persona lives a far more complex figure. In mid-nineteenth-century Vienna, the halls of the Hofburg Palace buzz not only with imperial waltzes and champagne but with temptations, rivals, and cutthroat intrigue. Feeling stifled by strict protocols and a turbulent marriage, Sisi grows restless. A free-spirited wanderer, she finds solace at her estate outside Budapest. There she rides her beloved horses and enjoys visits from the Hungarian statesman Count Andr�ssy, the man with whom she�s unwittingly fallen in love. But tragic news brings Sisi out of her fragile seclusion, forcing her to return to her capital and a world of gossip, envy, and sorrow where a dangerous fate lurks in the shadows. Through love affairs and loss, dedication and defiance, Sisi struggles against conflicting desires: to keep her family together, or to flee amid the collapse of her suffocating marriage and the gathering tumult of the First World War. In an age of crumbling monarchies, Sisi fights to assert her right to the throne beside her husband, to win the love of her people and the world, and to save an empire. But in the end, can she save herself? Featuring larger-than-life historic figures such as Bavaria�s �Mad King Ludwig� and the tragic Crown Prince Rudolf, and set against many of Europe�s grandest sites�from Germany�s storied Neuschwanstein Castle to England�s lush shires�Sisi�brings to life an extraordinary woman and the romantic, volatile era over which she presided. The story of Junior, a budding cartoonist growing up on the Spokane Indian Reservation. Determined to take his future into his own hands, Junior leaves his troubled school on the rez to attend an all-white farm town high school where the only other Indian is the school mascot. Wee Gillis lives in Scotland. He is an orphan, and he spends half of each year with his mother’s people in the lowlands, while the other half finds him in the highlands with his father’s kin. Both sides of Gillis’s family are eager for him to settle down and adopt their ways. In the lowlands, he is taught to herd cattle, learning how to call them to him in even the heaviest of evening fogs. In the rocky highlands, he stalks stags from outcrop to outcrop, holding his breath so as not to make a sound. Wee Gillis is a quick study, and he soon picks up what his elders can teach him. And yet he is unprepared when the day comes for him to decide, once and for all, whether it will be the lowlands or the highlands that he will call his home. While out searching for food, fruit bat Stellaluna and her mother are attacked by a vicious owl. Stellaluna is separated from Mother Bat and taken in by a family of birds where she must put aside her bat habits to fit in with her new family. But one fateful flight when she is separated from her adoptive siblings, Stellaluna is reunited with her bat family and learns that even though we�re different, we�re very much the same.